CMI CPA 320 (CEMENT PLASTERING AID) | CMI Marketing Sdn. Bhd. 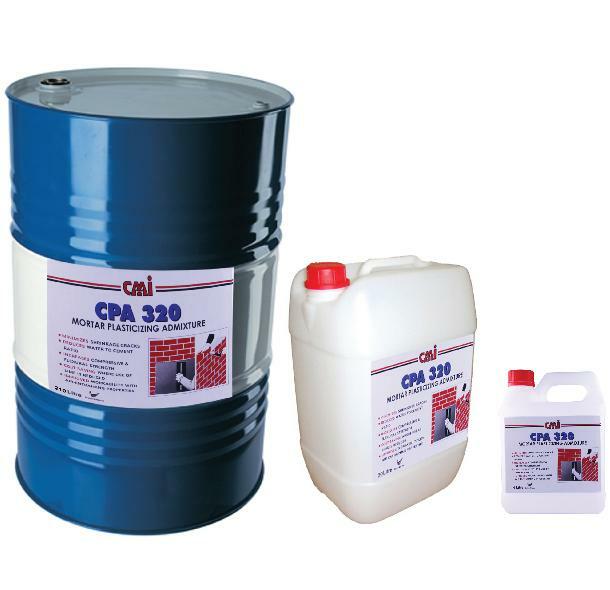 CMI CPA 320 is a wood-based resin plasticizer for cement mixes that conforms to BS4887. It helps to improve water-retention, workability, and compressive strength and reduces water to cement ratio by 10 to 15 %. - Cost saving where usage of lime is eliminated. - Increases compressive strength and enhances durability. - Improves workability for easier trowelling. - Reduces water to cement ratio. - Increases adhesion strength to substrates. Odour : Pleasant pinewood smell. Fire hazard : Non flammable. Mix ratio : Approximately 250 ml per 50 kg OPC ( Portland cement ). Packing : 4 litres, 20 litres & 210 litres. CMI CPA 320 should be added to the gauging water in the proportion of 250 ml per 50 kg of Portland Cement. Stir the mixture of gauging water thoroughly before adding into cement/ sand mixture. Note : Do not add undiluted CMI CPA 320 directly into the dry material. * Technical references are available upon request. Storage life is approximately 12 months if product is stored in a cool and dry place.